A Blue Line trolley departing from America Plaza on May 10, 2016. Megan Wood, inewsource. For the past 17 months, there have been no trolley accidents involving illegal left turns by downtown motorists. 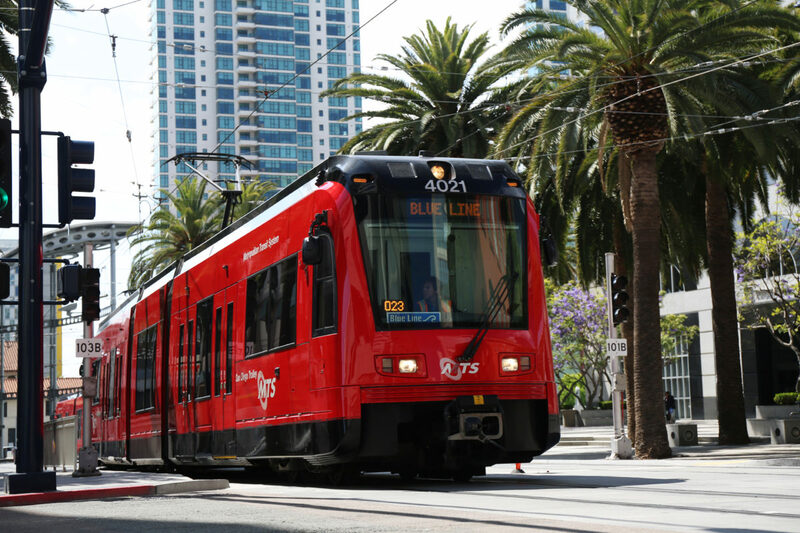 For that, the San Diego Metropolitan Transit System has earned a safety award from the American Public Transportation Association. MTS was honored after implementing its “Anticipate-Recognize-Take Action!” campaign, which over the last 17 months has cut the left-turn accidents to zero. The award was announced Monday at APTA’s annual rail conference in Denver, Colorado. This is the third safety award MTS has won in the last four years. In the 19 months prior to the campaign, there were 10 accidents involving trolleys and motorists making illegal left turns at eight identified intersections on C Street and Park Blvd, according to MTS. In the 17 months after the campaign began, accidents were reduced to zero. 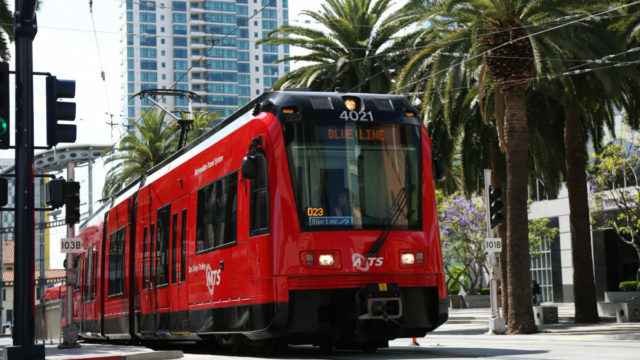 The approach that MTS used to reduce collisions for the 350 daily trains that move through San Diego’s downtown core was two-pronged: The agency installed lane delineators and eye-level signs at eight high-incident intersections along Park Boulevard and C Street; it also implemented a defensive driving program for train operators focused on the downtown core.